We are putting forward a set of efforts to ease the path for newcomers willing to try out OpenNebula. For starters, we are creating a new set of OpenNebula Sandboxes that will enable users to launch a complete cloud in 5 minutes in their laptops, following minimal set of steps. Using the functionality to emulate execution environments offered by qemu, a single virtual machine instance can contain an OpenNebula front-end and a virtualization node, as well as prepared images to offer a complete and rich cloud experience. Users will be able to log into an OpenNebula cloud, peer the managed resources and launch instances of virtual machines without the hassle of configuring a physical infrastructure. These Sandboxes comes in two flavours, one prepared for VirtualBox and one for KVM. Work in progress includes an Amazon EC2 AMI version of the sandbox, to ease the last hassle for the user willing to try OpenNebula, which is launching the virtual machine containing the Sandbox. We are also working in guides to extend the Sandbox OpenNebula installation to enroll external nodes to build small-scale clouds, as well as quickstart guides to swiftly install OpenNebula in the most common Linux and hypervisor combinations. We will proceed to gradually shutdown the previous try out mechanisms, like the VMware and previous KVM Sandbox, as well as the demo public cloud. We hope this will make easier people’s work at the time of trying out OpenNebula! 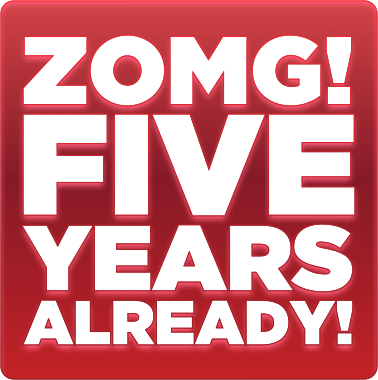 We’ve had a lot to celebrate around here lately, including our fifth anniversary. Although OpenNebula started as a research project more than 7 years ago, it was in november 2007 when we created the OpenNebula open-source project. Since then, 12 stable versions have been released in a rapid release cycle to accelerate the transfer of innovation to the market, and OpenNebula has evolved into an active open-source project with a steadily growing community that, by many measures is more than doubling each year. What’s more interesting behind these figures is the quality of our community and their valuable contributions that include Industry and Research leaders building enterprise private clouds, cloud services, and clouds for HPC and Science. According to C12G’s latest Cloud Architecture Survey, the majority of OpenNebula deployments, 43 percent, are in business accounts compared to 17 percent in research, and less than 10 percent in academia. It is encouraging to receive such a great feedback from you. We are extremely happy with the organic growth of the project. It’s seven years old, it’s parked in some of the biggest organizations out there, and that all happened without any investment in marketing, just offering the most advanced and innovative solution for cloud management. An active and engaged community, along with our focus on solving real user needs in innovative ways and the involvement of the users in a fully vendor-agnostic project, constitute the OpenNebula’s recipe to success. We’re now looking towards the next five years and continuing to focus on making sure OpenNebula continues to be the most solid, powerful and flexible open-source management platform to build and manage enterprise clouds. If you haven’t had a chance yet, please check out all of the new features of OpenNebula 3.8. And, as always, feel free to contact us with any questions! https://opennebula.org/wp-content/uploads/2018/11/opennebula_cloud_logo_white_bg-4.png 0 0 Ignacio M. Llorente https://opennebula.org/wp-content/uploads/2018/11/opennebula_cloud_logo_white_bg-4.png Ignacio M. Llorente2012-11-15 17:41:142012-11-15 18:03:15OpenNebula Celebrates Five Years! As part of FOSDEM (one of the most important european events in the open source arena), the OSS Cloud IaaS projects (OpenNebula, Eucalyptus, OpenStack, CloudStack) are organizing a Cloud devroom. This Cloud devroom, will be an excellent opportunity to promote your solutions with OpenNebula, share your experiences operating/bulding/designing a Cloud with OpenNebula at your company or institution, meet some of OpenNebula developers, and discuss with others about OSS Cloud technologies. Below you can find the complete CFP, but feel free to contact the fosdem list for more information. Hope to see you next year at FOSDEM 2013!! The organizers of the Cloud devroom at FOSDEM 2012 invite you to submit a session proposal. The purpose of this devroom is to serve as a meeting point for cloud infrastructure projects, including a unique opportunity for discussion and collaboration between developers from different projects. This devroom will be focused on open source cloud infrastructure projects. Preference will be given to developer oriented proposals for projects in the IaaS (Infrastructure as a Service) space, such as CloudStack, Eucalyptus, OpenNebula, or OpenStack. However, we are open to proposals from other related projects, such as cloud management, deployment, and orchestration, as well. If you would like some help refining your proposal, or would like to discuss what topics are most appropriate for this devroom, please use the cloud-devroom at lists.fosdem.org mailing list. The cloud devroom will last for one day: Sunday, February 3, 2013. C12G Labs is happy to announce the availability of the first public training course on OpenNebula Fundamentals for cloud integrators, architects and administrators. The course, to be held at C12G headquarters in Madrid on the 11th of December, spans across 3 days and covers the process of installing, configuring and operating private, public and hybrid clouds using OpenNebula. There is a 20% discount on public training for active customers and partners, and for Education, Government and Non-Profit institutions or organizations working in research projects. Other locations in Europe and United States to hold the training are also being considered. Please contact us if your would like to request training near you. More information on C12G public and private courses can be found in the training pages. C12G Labs has just announced a new release of OpenNebulaPro, the enterprise edition of its widely-deployed open-source management solution for enterprise data center virtualization and private cloud computing. OpenNebulaPro integrates the most recent stable version of OpenNebula (3.8) with bugfixes, performance, and scalability patches developed by the community and by C12G for its customers and partners. OpenNebula 3.8 (codename Twin Jet), released one month ago, enhances its AWS and OCCI API implementations and provides a tighter integration with VMware and KVM. C12G also announces the first stable release of the OpenNebulaApps, a suite of tools for users and administrators of OpenNebula to simplify and optimize cloud application management. OpenNebulaApps provides a service management layer on top of OpenNebula by configuring the software stack in the applications, managing multi-tiered applications, providing configurable services from a catalog, and building your own private market to distribute applications across several OpenNebula instances. Cloud applications consist of complex software stacks, OpenNebulaApps helps to manage their life-cycle and contributes to significantly reduce the time needed to build, distribute, and deploy cloud applications. According to C12G’s latest Cloud Architecture Survey, the majority of OpenNebula deployments, 43 percent, are in business accounts compared to 17 percent in research, and less than 10 percent in academia. Moreover most of the surveyed organizations are using their OpenNebula cloud for running production workloads. OpenNebulaPro provides these corporations, research centers and governments with a hardened, certified, long-term supported cloud platform. Compared to OpenNebula, the expert production and integration support of OpenNebulaPro and its higher stability increase IT productivity, speed time to deployment, and reduce business and technical risks. OpenNebulaPro and OpenNebulaApps are provided under open-source license to customers and partners on an annual subscription basis through the OpenNebula.pro Support Portal. The subscription model brings several additional benefits in terms of long term multi-year support, integration and production support with professional SLAs, regular maintenance releases, product influence, and privacy and security guarantee, and all at a competitive cost without high upfront fees. C12G Labs also offers professional services to help at any stage of cloud computing adoption with OpenNebula. OpenNebula delivers the most feature-rich, customizable and open solution to build enterprise virtualized data centers and private clouds. OpenNebula is an active project with a very large user base, with more than 5,000 downloads per month and thousands of deployments that include leading research centers like CERN, FermiLab and ESA; supercomputing centers like SARA and NCHC; telecom operators like RIM, China Mobile and Telefonica O2; and integrators like Logica, Engineering and KPMG. OpenNebula and C12G are trademarks of C12G Labs. All other company and product names mentioned are used only for identification purposes and may be trademarks or registered trademarks of their respective companies. 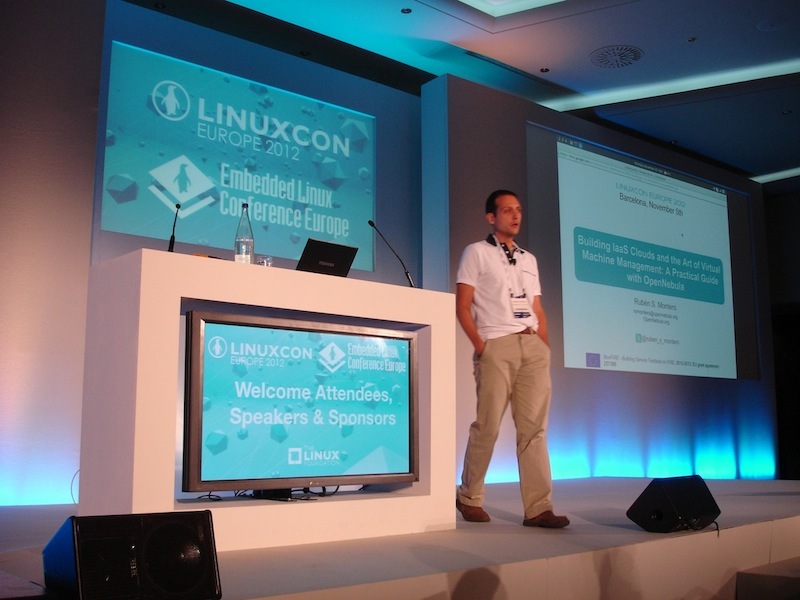 Last Monday we were at LinuxCon Europe, held in the beautiful city of Barcelona. Rubén gave a talk about building IaaS clouds and the art of virtual machine management, while he created a small OpenNebula private cloud in his laptop from scratch. He even had time to import a couple of images from the Marketplace, and boot them. We would like to thank the Linux Foundation for the invitation to participate in this event, giving us the opportunity to chat with some of our users. We also had the chance to talk about the future of the open cloud with our beautiful open source sisters. What sisters? you may ask. Well, this is how Mårten Mickos referred in his keynote to the main 4 open source cloud technologies Eucalyptus, CloudStack, OpenStack, and OpenNebula in reply to VMware, and I hope the term catches on.